Why to choose bamboo floor? Many homeowners choose bamboo floor among other floor options because it gives them natural wood beauty look and adds elegance to their homes. In addition, it is a cheaper alternative compare to hardwood floor. It can be quite a noticeable difference not only in terms of material, but in labor cost also. Bamboo is a member of a grass family and naturally grows in different warm climate regions, but most of the population concentrates in Asia. Bamboo is a very fast growing plant, it takes only about 5-7 years to reach a size that can be used for production of bamboo flooring. Biggest bamboo plans are used for construction purposes, including floor manufacturing. Since it is not a tree, as a lot of people might think, there is no need to replant it (after harvesting it will grow again). Bamboo flooring planks are commonly in the form of a tongue and groove style installation, which come in 3 to 6 feet lengths. Also bamboo floors are smooth and very look like usual wood floor, not like reeds of bamboo that some homeowners might imagine. The same as traditional hardwood bamboo floor can be factory prefinished or unfinished, which require sanding and finish application at a job site. If it is prefinished bamboo floor material, it does not require sanding and multiple coats of stain and finish. In other words, it is immediately ready to use and can be installed even as a Do-It-Yourself project. Bamboo flooring can be nailed, glued or floated over a dense padding designed specifically for this type of flooring. By its construction bamboo floor can be solid, engineered or strand woven. - Solid bamboo flooring, unlike solid hardwood floor, made from strips of the bamboo glued together. The strips can be adhered together either horizontally – a few layers on top of each other or vertically – next to each other. - Engineered bamboo flooring consist a layer of bamboo on top and a layer of other material, usually plywood or fiberboard underneath. - Strand woven bamboo made from the strips which are laminated together under heat and pressure. This floor is much harder and durable in comparison with other types and a very good option for heavy traffic areas. Bamboo floor is available in different colors from natural (light) to custom stained. For creating deeper and darker colors bamboo can be heated or carbonized, but this will make bamboo softer what might be not that desirable. Hardness and durability of bamboo flooring depend on manufacturing process and from the plants. 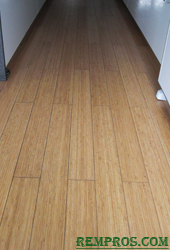 The less heat or carbonate manufacturers use the more durable and hard bamboo floor will be. Now manufacturers start to use formaldehyde-free and non-toxic glues in processing of bamboo floor materials. Which makes it completely safe for your home. As many other flooring materials, bamboo floor material has its cons also. It can be relatively easy scratched, dented, and chipped. It can fade and dull with the years. However, with reasonable use bamboo floors can last long and bring you many years of trouble free enjoyment. Bamboo flooring cost will vary and depend on a type of bamboo, quality and installation method.